Flamingo restaurant was established in 1991. During the spring of that year, Apostolis (the owner) noticed a couple of strange,beautiful birds that he was quite impressed by, in the Aliko region of the island. 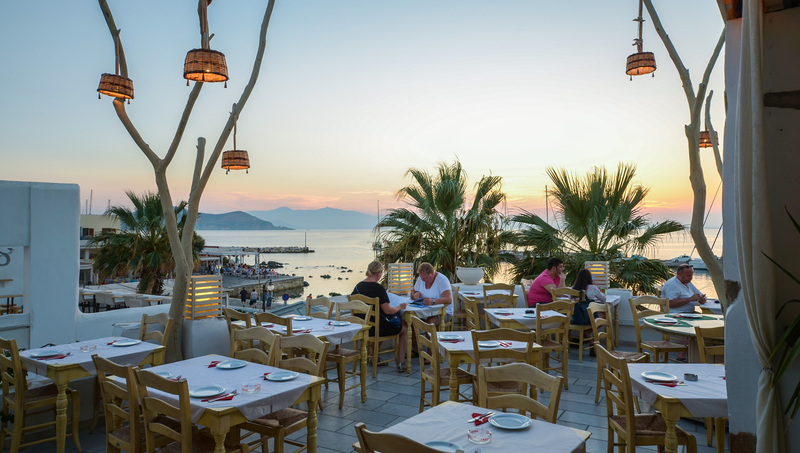 When he found that those rare visitors of Naxos were actually a couple of flamingos, he had found the name of the restaurant, which was, at the time, beginning its operation. Situated at the most privileged spot of Chora's seaside walkway, with a panoramic vieuw of the harbor and the Aegean Sea, "Flamingo"restaurant-cafe-bar offers selected Greek and Mediterranean cuisine dishes, based on fresh, locally produced ingredients: Naxian meat,vegetables from the family garden as well as fresh fish. Whether you choose to enjoy your meal on the large terrace with the unique sunset view, or in the garden, accompanied by live, traditional greek music, we promise you one surely special night.